In affiliation with the British Fellowship of Hairdressing and the official F.A.M.E. Team UK, M Division proudly presents The Australian F.A.M.E Team. The Fellowship Academy for Merit and Excellence, is a platform created for our industry’s up and comings to be a part of a team to inspire, grow and guide their passions. Most major names in the hair industry have one thing in common – along their journey, they have been a part of the F.A.M.E Team. 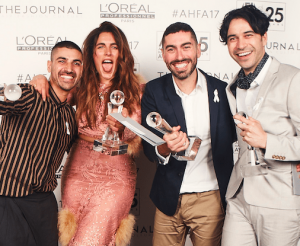 Besides providing industry leading session stylists, F.A.M.E Team hosted winners of Australian Hairdresser of the Year, Newcomer of the Year, WA Hairdresser of the Year, VIC/TAS Hairdresser of the Year, Creative Colourist of the Year and London Hairdresser of the year. The list of accomplished hairdressers this initiative has grown, goes on and continues to grow. An initiative that spans two decades and two Continents, F.A.M.E Team has pioneered the growth and backbone of the industry’s biggest names, nationally and internationally. With past members including Errol Douglas, Sasha Mascolo, Lores Giglio, Joey Scandizzo, Kylie Oaks, Richard Mannah, Lyndell Mansfeild and Antoinette Beenders to name just a few, this initiative continues to set the platform for the future stars of our craft.